Safelincs are pleased to launch Geofire’s Agrippa acoustic fire door holders and free-swing fire door closers, featuring industry leading technology that enables the devices to recognise the specific sound of your fire alarm. Fire Door Holders (also called fire door retainers) are installed on fire doors that have already an overhead fire door closer installed. They hold the fire door open against the pressure of the closer and will release the fire door in case of a fire, allowing it to be closed. Free-Swing Fire Door Closers are installed instead of normal overhead fire door closers. They exert no closing pressure on the door in normal operation, therefore allowing the fire door to swing freely, just like a normal door. In the event of a fire their function changes to that of a normal door closer, forcing the fire door shut. Most traditional fire door holders and free-swing door closers are connected to the fire alarm system by wire and receive their signal to close from the fire alarm panel. The Agrippa acoustic technology, however, is triggered by the acoustic sound of your smoke alarm or fire alarm system sirens. This is particularly helpful for premises without a fire alarm system and central panel, or where retrofitting a wired system would be problematic. Unlike other acoustic fire door holders and fire door closers, Geofire’s Agrippa devices listen to and then learn and recognise the sound of your particular fire alarm siren or smoke alarm, meaning that they won’t trigger your fire door to close if they hear other loud noises. This ground-breaking technology will therefore reduce the number of false door releases. Both the Agrippa fire door holders and the Agrippa free-swing door closers are wireless and very easy to install on existing or new fire doors. They are fitted to the top of the door in a discreet way and allow you to keep fire doors open legally and effectively giving you the flexibility you need to allow free movement within the building. They enhance the accessibility for the disabled and improve ventilation. The Agrippa acoustic door holder retains fire doors in the fully open position. No intermediate positions of the fire door are tolerated. The main Agrippa body, containing the sensors and a strong electromagnet, is fitted on the wall behind the door and a steel plate is fitted to the back of the door which the magnet then holds. On hearing your fire alarm the magnet is switched off and the fire door will be closed shut by the closer fitted to your fire door. In comparison, the Agrippa free-swing door closer allows you to use your fire door like a normal door, meaning that it swings freely and can be left open in any position. When the device hears your fire alarm the integrated door closer will be triggered and closes the door, stopping the spread of fire and smoke. Keeping fire doors shut or having a system in place that closes fire doors in case of a fire is a legal requirement . A breach of this requirement can lead to prosecution and even prison sentences. To place an order or to find out more about our Geofire Agrippa products call 01507 464185 or email support@safelincs.co.uk. Although the wedging open of the fire doors may have made it easier for staff to negate the problematic fire doors it introduced a serious issue. Wedging a fire door open is illegal and puts lives at risk. A closed fire door prevents the spread of fire and protects staff and patients within the hospital. If the fire door cannot close in case of a fire, smoke and fire will spread through the building. Mike Farrell wanted to find a solution that would enable his staff to transport patients easily from one department to another and still comply with the fire safety regulations. For those confined to care homes moving freely within the immediate environment is essential for their well-being and self-esteem. However, fire regulations require that fire doors, such as they are installed in gangways and often in bedrooms, are kept closed to prevent the spread of smoke and flames in the event of a fire. The hydraulic door closers, usually installed for this purpose, make the fire doors difficult to open for the elderly and those who require walking aids. Installing a normal fire door retainer to hold the fire door open against the pressure of a traditional door closer does not fully address this problem, as it still requires the fire door to be opened in the first place before it can be retained in the open position. This is why Free-Swing fire door closers are required. 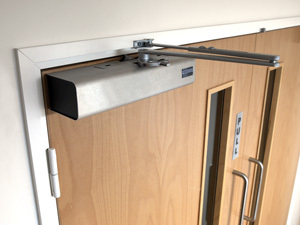 They allow the user to open and close the fire door like any other door – without any resistance. The door can also be left open in any desired position. If the fire alarm goes off the fire door will, of course, close and the occupants of the building are protected against the spread of fire and smoke. Some of Safelincs’ free-swing door closers require wiring into the fire alarm panel to ensure the door shutting is closing the door when a fire is detected. Our Freedor free-swing door closer, on the other hand, does not require any wiring at all. Similar to the well known Dorgard manufactured by the same UK company, the Freedor ‘listens’ for the sound of an alarm system and will close the fire door, as soon as the acoustic signal is received. The Freedor unit is battery powered and is also suitable for retro-fitting on existing fire doors. 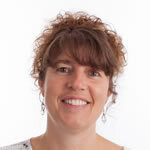 If you require any further information call 0800 612 6537 where there are experts on hand to offer advice. After the recent BBC investigation about London care homes not meeting fire safety regulations there has been an important court ruling that will hopefully change the behavior of care home owners and increase the safety of the residents. The issue regarding resident bedroom doors, which must be fitted with self closing fire doors, and the risk of these fire doors being wedged open in an illegal manner was addressed. Fire doors are generally heavy and when fitted with a self closing device very hard for an elderly person to open. In the case of care homes fitting bedroom doors with these devices will restrict the mobility and independence of residents. The fear was that care home owners will then wedge the doors open to allow residents to freely move in and out of their bedrooms. This practice is illegal and the judicial ruling now stipulates that self-closing fire doors must be fitted with a device that will hold the door open and which releases the door when a fire alarm is triggered, allowing the fire door to be closed with the door closer to prevent the spread of fire. This is ruling is paramount in ensuring the safety of vulnerable residents. The solution to this new ruling need not result in having a new system wired into the premises but can be resolved with wireless devices such as Dorgard or Freedor. Both devices are wireless and can be fitted retrospectively to fire doors without the need of an electrician. The Dorgard can be fitted to any door with a self closing device and will hold the door open until the fire alarm sounds. At this point the door retainer will lift the plunger and the fire door will close. The Freedor works in a similar way but it acts not only as a door holder but also as a door closer, incorporating the two devices in one. This device can hold the fire door open at any angle required and will then release and close the fire door on the sounding of the fire alarm. Both fire door retainers have a night time closing feature and have adjustable sensitivity. As the Dorgard and Freedor are both wireless products they can be fitted by a handy man rather than a costly electrician. The Dorgard has a 5 year warranty, which is only available from Safelincs Ltd.